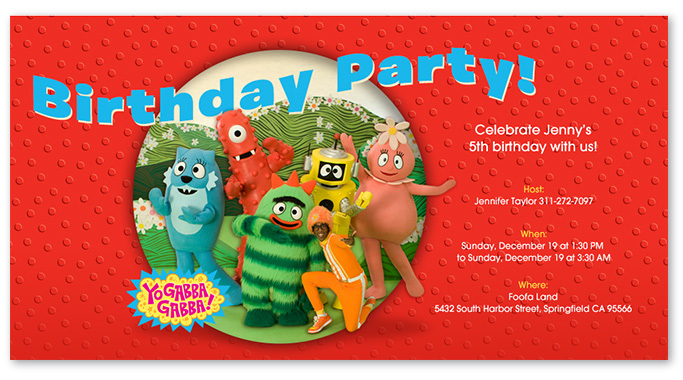 Kids love to incorporate their favorite television show into their birthday party, and Yo Gabba Gabba! is a popular favorite. Guest stylist Jesi Haack of Jesi Haack Design created a unique ambiance, inviting guests into a magical place filled with friendly toy monsters and musical references. Best of all, this party was designed to be easy as well as visually stimulating. 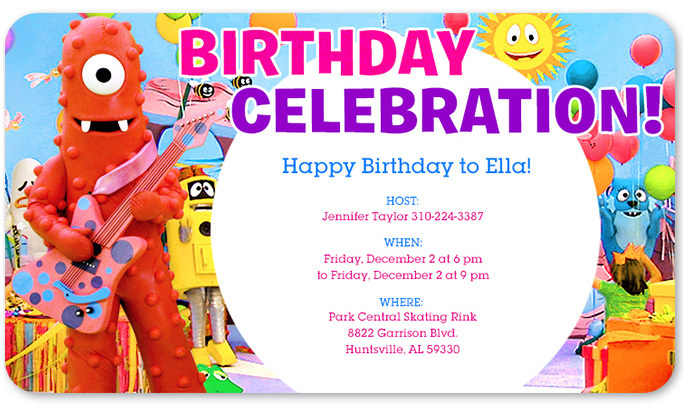 Busy parents with limited time can actually recreate the elements of this birthday party with a minimum of work. 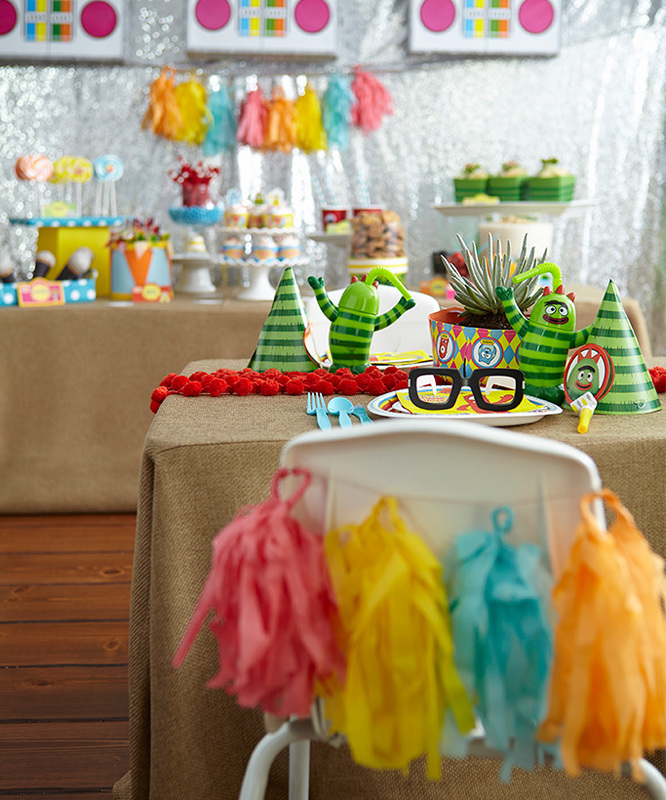 From the party decorations to the three-step menu, this Yo Gabba Gabba!-themed event is as doable as it is dazzling. Inspired by the bright hues of the Yo Gabba Gabba! theme, Jesi created a look that’s colorful and upbeat. Kids can’t help but smile when they see their favorite characters on hats, cups, and child-size chairs! A backdrop of character stand ups including Brobee, Plex, Foofa, Muno, Toodee, and DJ Lance Rock set the stage for the scene. Jesi’s take on the tablescape: Place settings that layer Yo Gabba Gabba! dinner plates with themed dessert plates and napkins (plus pairs of DJ Lance Rock’s signature black-rimmed glasses on top). 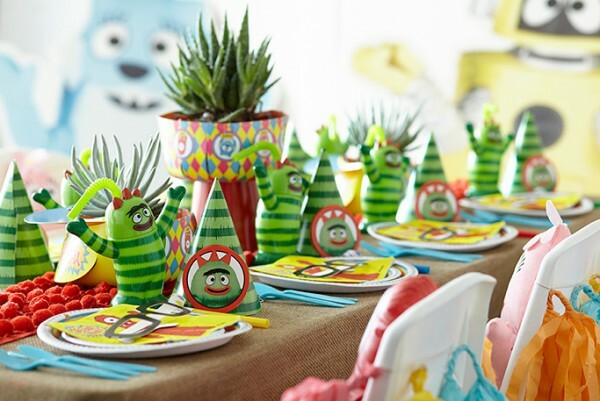 Brobee cups and party hats add a splash of green to the table, as do creative centerpieces (one of which is propped on an upside-down pail for height). 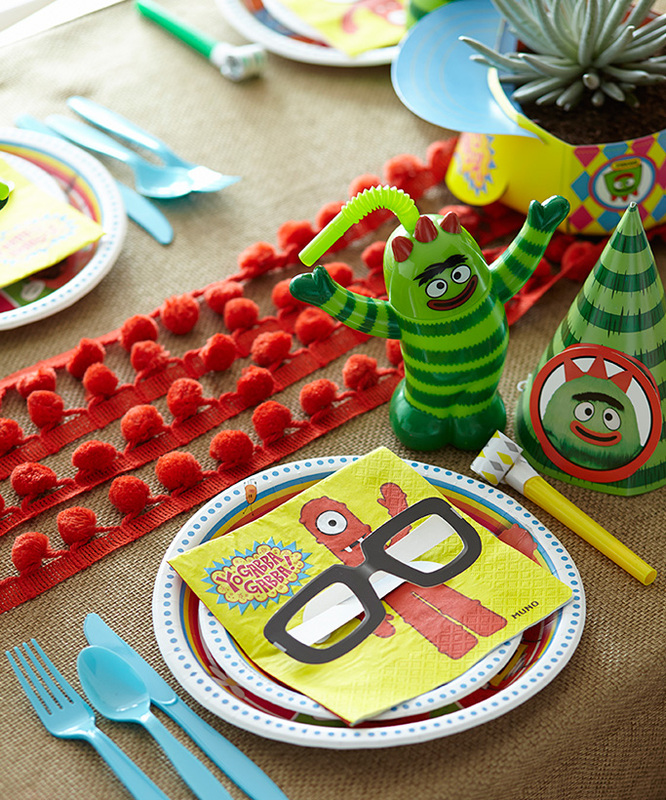 Turquoise utensils and festive stretches of red pom-pom fringe pop against a burlap tablecloth, and Yo Gabba Gabba! character dolls wait patiently on child-size chairs for guests to arrive. 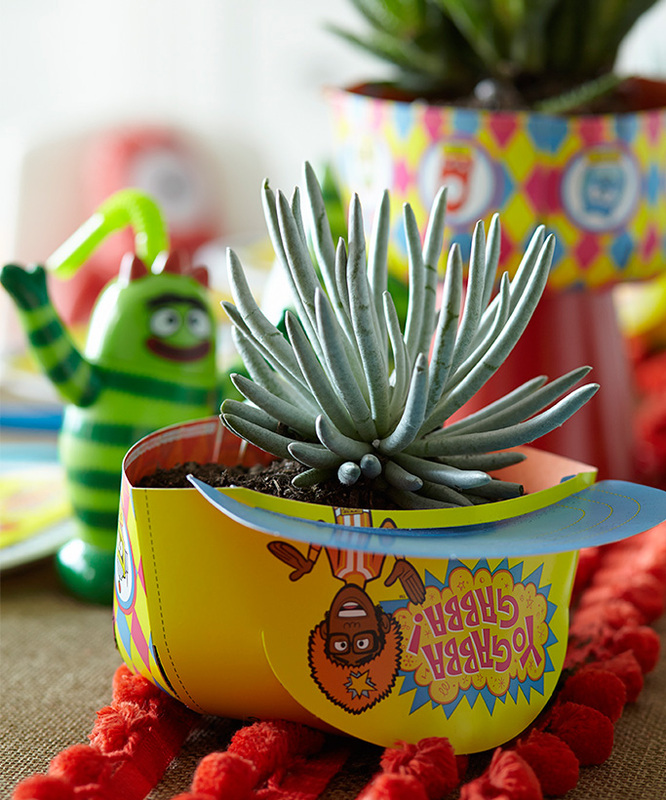 Creating centerpieces with upside-down Yo Gabba Gabba! trucker hats covering the planters of decorative succulents is just one of the unique design aspects Jesi incorporated. Alternative place setting: Yo Gabba Gabba! activity place mats keep kids entertained and ensure a spill-safe zone. Solid-color dinner plates beneath Yo Gabba Gabba! dessert plates add charm while sports bottles and mini award medals wrapped around yellow napkins and utensils can double as favors. 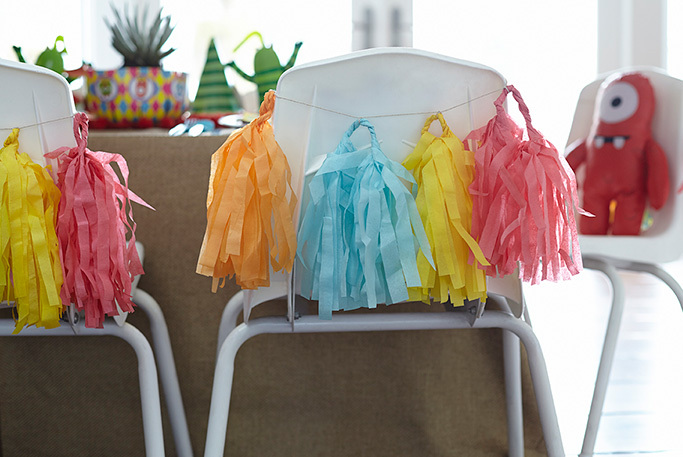 Jesi dangled DIY tissue-paper pom poms over chairs to gussy up guest seating. Earth tones and garden accents balance a super-colorful palette, creating a look that’s fun yet relaxed. 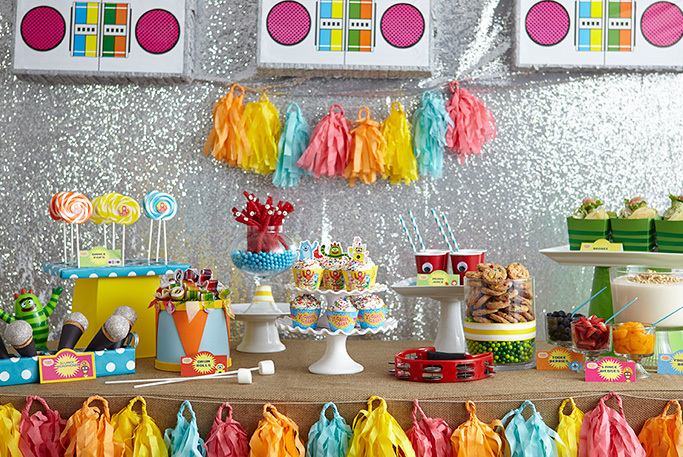 Shimmery fabric embellished with radio piñatas and Jesi’s tissue-paper pom poms make an impressive backdrop to a food table that’s surprisingly simple to pull off! 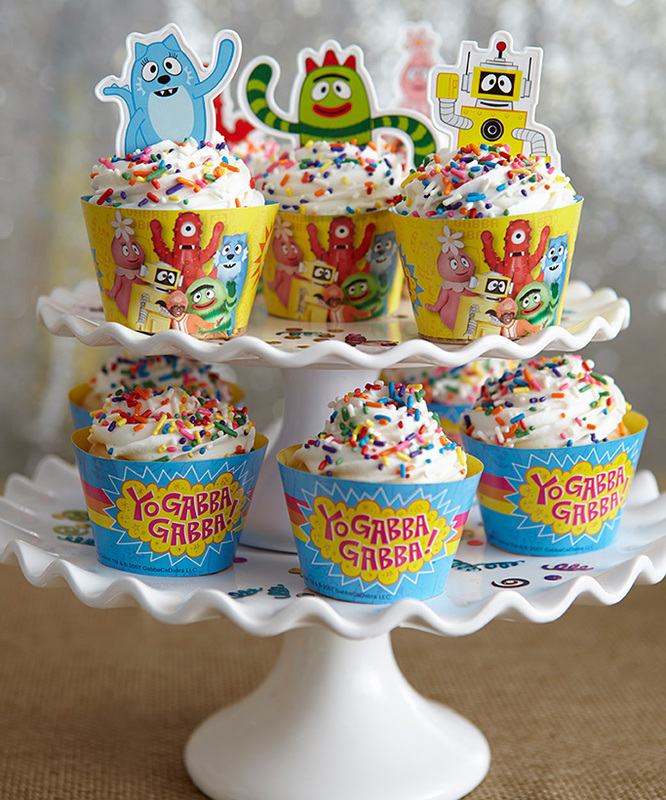 Take white bakery cupcakes up a notch with Yo Gabba Gabba! 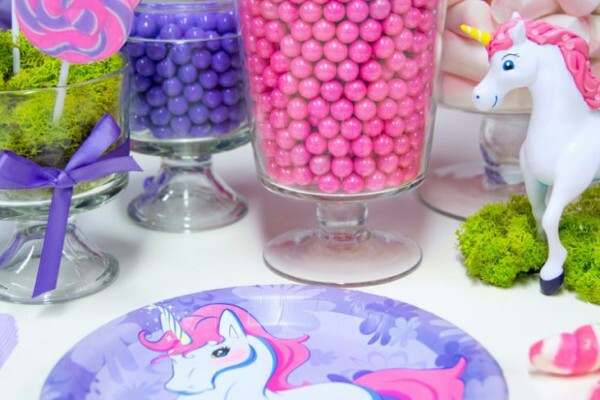 cupcake wrappers, cake toppers, and multicolored jimmies. 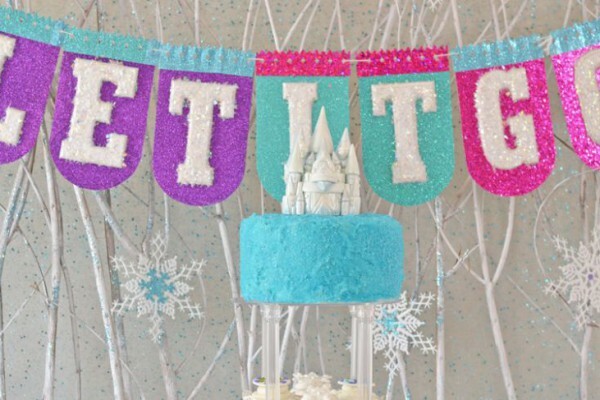 A sprinkling of confetti on the cake stands adds a cheerful touch to the presentation. A supervised sparkler is a clever alternative to a candle on a birthday cupcake. 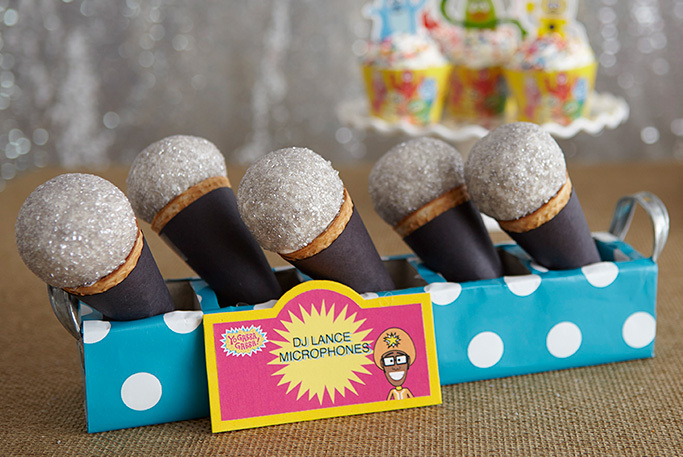 These edible “DJ Lance Microphones” are deceptively easy to make using store-bought drumstick ice cream cones dipped in silver sanding sugar! 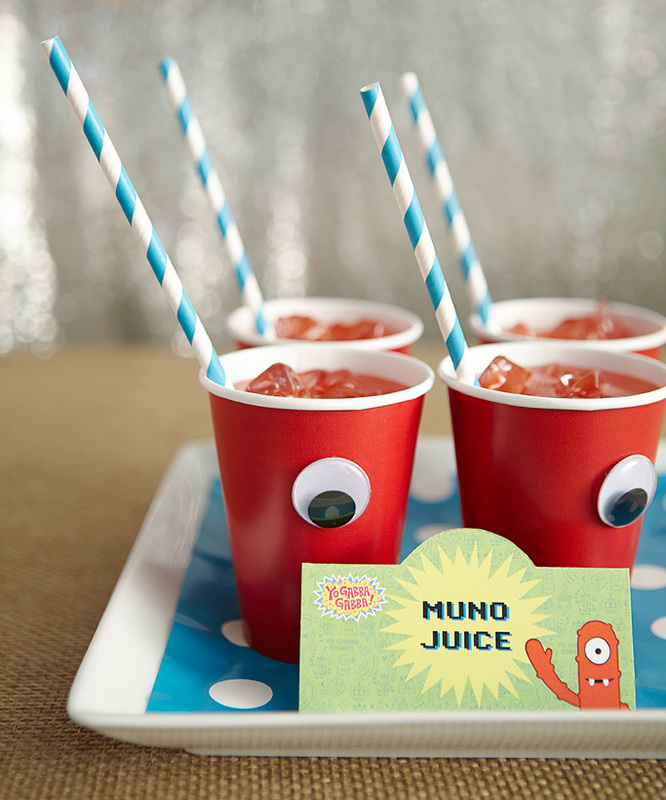 Fruit punch becomes “Muno Juice” when served in red cups with decorative eyes and stripey straws served on a white tray lined with polka dot gift wrap. Need to add a healthful lunch option? 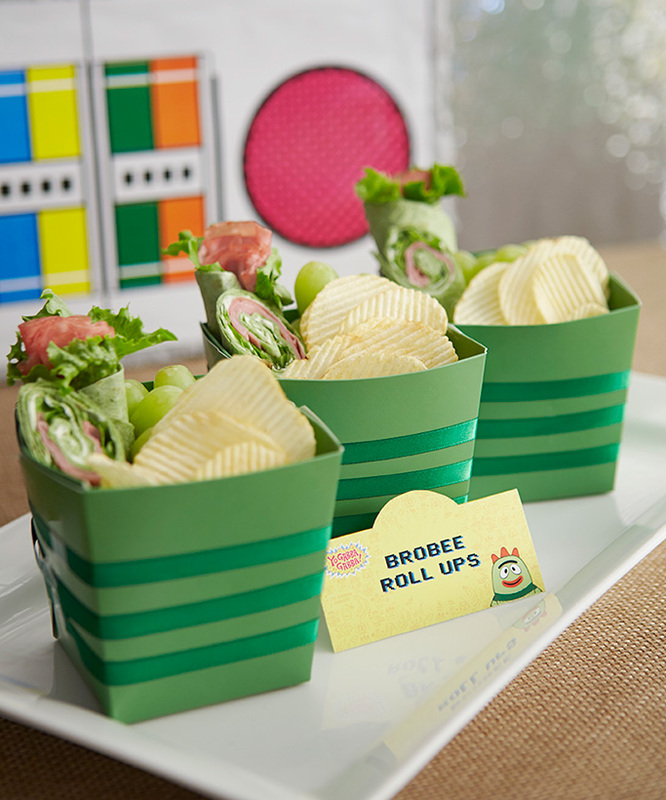 Our “Brobee Roll Ups” go great with potato chips and fresh grapes, and empty favor pails are great for keeping everything together. 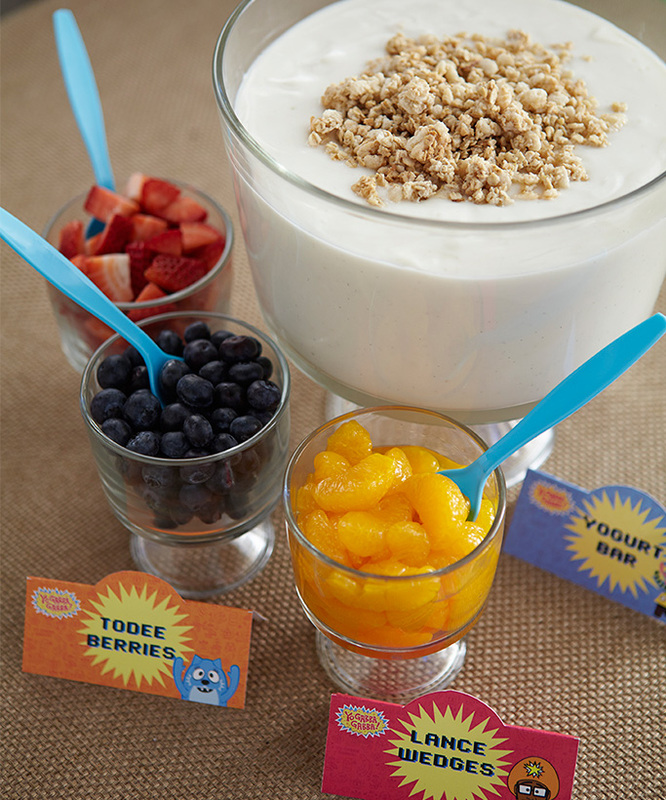 A yogurt bar is a colorful (and nutritious) option for a lunch side at a party. 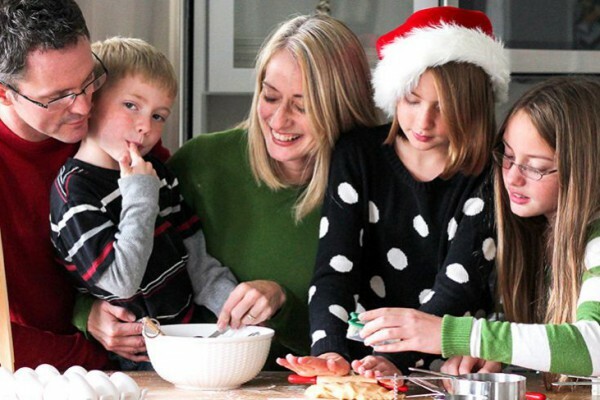 Just spoon your child’s favorite flavor into a trifle bowl, top with granola, and set out bowls of fruit that guests can scoop onto their yogurt with spoons. We used blueberries, strawberries, and tangerine sections and labeled them “Lance Wedges” and “Todee Berries” with colorful printables you can download. 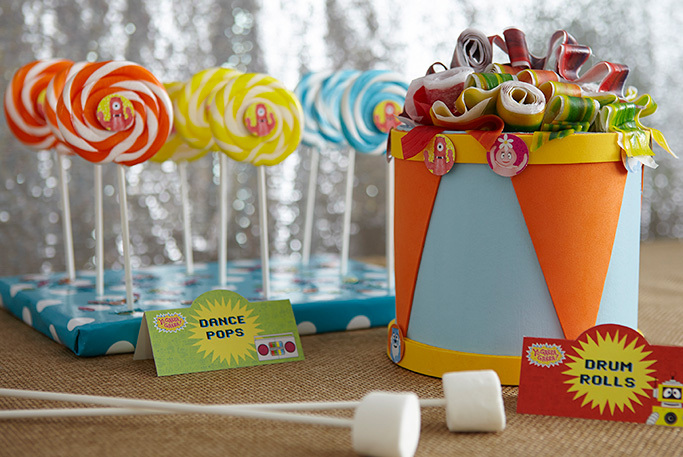 Orange, yellow, and blue whirly pops — or in this case “Dance Pops” — decorated with lollipop stickers and inserted in a slab of foam wrapped in polka dot gift wrap. Fruit roll-ups arranged on the top of a toy drum. (We made our own by adding paint, foam cutouts, and stickers to a cardboard “paint can” purchased at a craft store.) Large marshmallows on lollipop sticks make great “drumsticks” for added decoration. 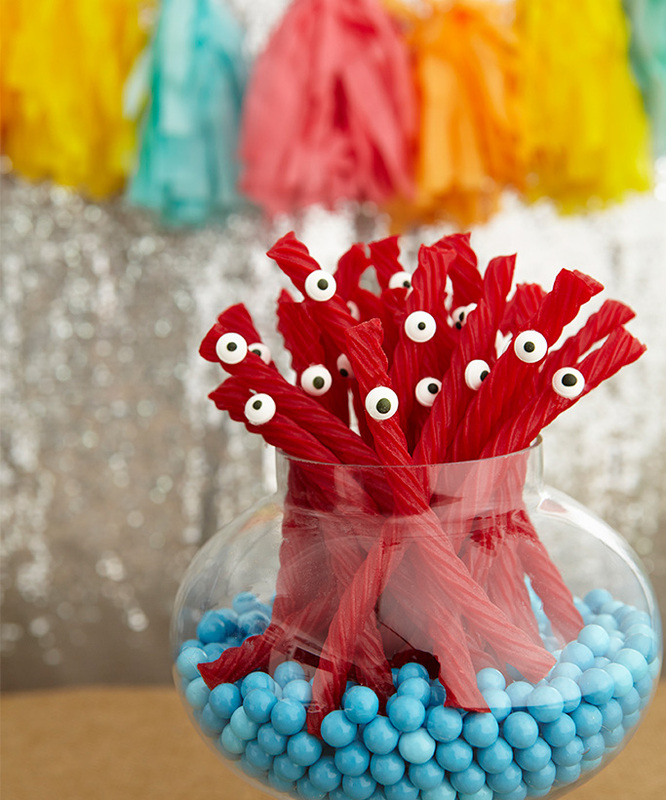 Red Vines accented with candy eyes (we used dots of icing to make them stick) and placed in an apothecary jar lined with Sixlets candy. The fun of putting a puzzle together is magnified by the size of a Yo Gabba Gabba! Brobee floor-puzzle activity. Divide the kids into two teams, give each team a puzzle to complete, then start the timer. The group that has more of the puzzle put together when the buzzer goes off wins. Kids will be thrilled with this fun take on the classic “Pin the Tail on the Donkey” game. 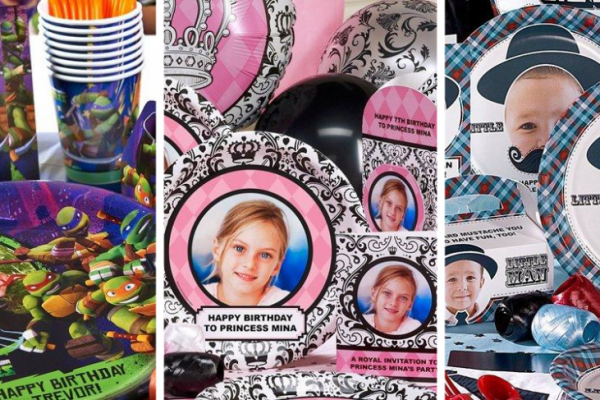 Hang the party game on the wall, hand out the enclosed food decals, and have each child try to place their decal on game board while blindfolded. 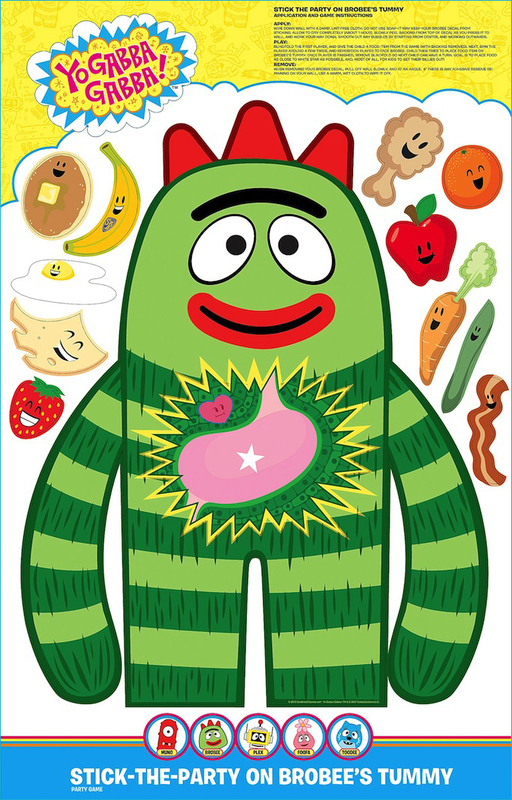 The child who “pins” their food closest to the star on Brobee’s tummy wins! 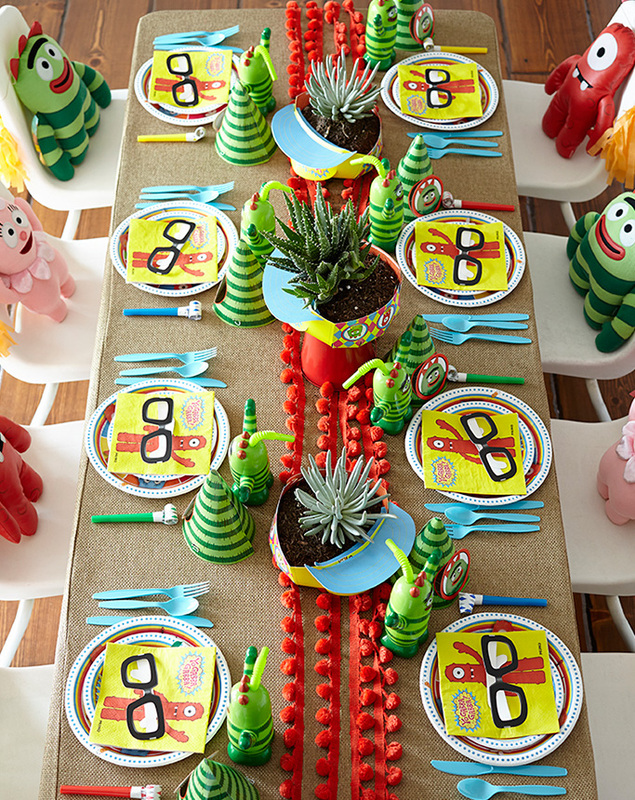 Brobee cups and DJ Lance glasses can be used at the party and then go home with guests. Yo Gabba Gabba! character dolls incorporated into the dining-table decor double as take-home favors. We upgraded our basic Yo Gabba Gabba! invitation by attaching matching pieces of confetti to the colorful stripes with adhesive dots and sealing the envelope with a sticker. For extra fun, fill with loose confetti before sealing. Prefer the convenience of an electronic invitation? 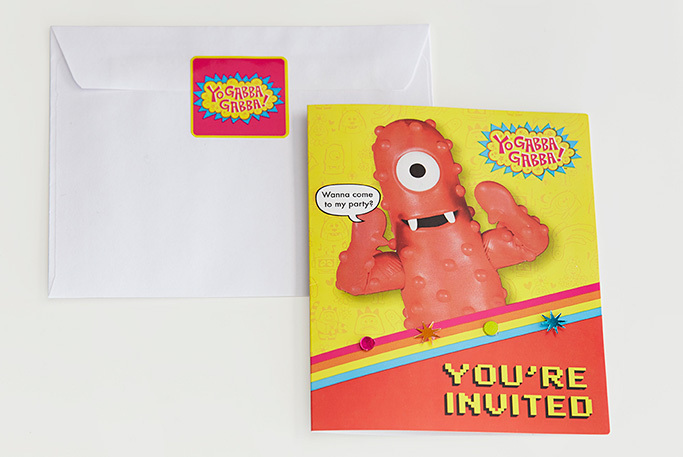 Evite has plenty of Yo Gabba Gabba!-themed invitations for birthday parties, such as the Muno Guitar and the YGG Group Shot below. 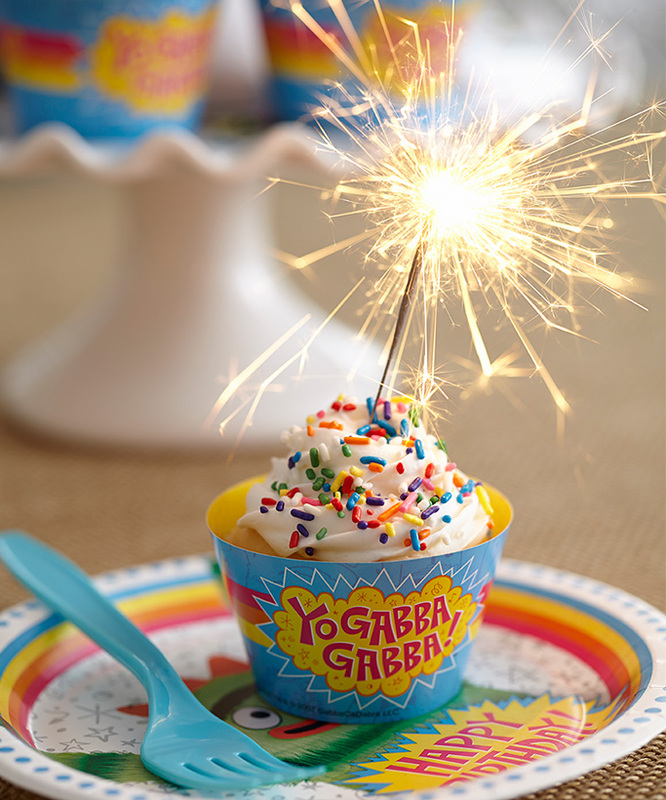 View the entire line of Yo Gabba Gabba! products by clicking here.